Arabian Delight Meethae Samosae recipe by Farheen Khan at PakiRecipes.com. 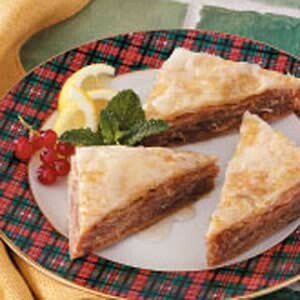 A triangular pie, which is bread stuffed with a mixture of hearty nuts and sugar. Take flour add 2 tbs of oil in it than knead the flour with water until its done. It shouldnt be too hard or too soft. Leave it for about half an hour (if u have time). In another bowl mix all the ingredients with sugar upto 3 tblspoon or as desired this will serve as the filling. Then take small balls of the dough & make thin covering just like peeta bread & cut that into half. Now place 1 tblspoon of filling in each half & give it the shape desired like a samosa or any other shape. Seal the ends with water. Chill it in the freezer for 30 min for good results than deep fry them. Serve them hot & enjoy. Really helpful tasted v. nice.